Gavin Rees claims he will knock out unbeaten champion Adrien Broner when they meet for the WBC lightweight title in Atlantic City on Saturday. Welshman Rees, 32, said the American's attitude "stinks". "He shows fighters no respect," Rees said. "He hasn't even earned the right to do that. What has he done? "I've been in the States for five weeks now and American boxing fans don't like him. They tell me they hope I beat him and shut him up." Broner, 23, is regarded as one of the best boxers in the world, and is ranked sixth in The Ring magazine's pound-for-pound ratings. The former WBO super-featherweight champion, who moved up to the lightweight division in 2012, is unbeaten in 25 fights as a professional, with 21 of those victories coming inside the distance. 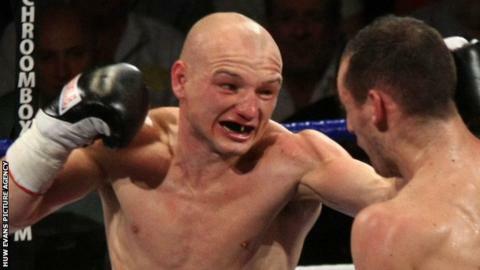 He is the overwhelming favourite to beat Rees, a former WBA light-welterweight champion. But Broner rejected the accusation of disrespecting his opponents, saying: "I don't underestimate him [Rees]... I respect him as a fighter. "I respect every fighter because only a boxer knows what we go through once we get into that ring. "He [Rees] is a former champion at light-welterweight. He's coming down in weight so he is used to getting hit by strong fighters." Broner, who likes to rap on his ring walks, is still expecting a quick victory on Saturday. "I am not about to miss the boulder on this man's shoulders," he said. "He is going to be there all night or until I put him to sleep. We are going to be eating ice cream in no time." Rees caused a major upset in 2007 when he beat Souleymane M'baye to win the WBA light-welterweight belt, but lost the title in his first defence against Andreas Kotelnik in March 2008. A drop in division to lightweight has brought him European and British titles in a run of 10 victories and a draw from 11 fights, and he insisted he could beat his younger opponent. "I'm going to knock [him] out... and I can't wait," Rees said. "I've never been stopped. I can take him out in the first round, but I am ready to go into deep water if I have to. "Either way, I have trained hard and will be ready to dictate the pace of the fight and not let him get away with a lot of what other fighters have let him do. "I have to watch for his right uppercut which he throws from down low, but he's not the best on his feet either. Work rate is going to be important."